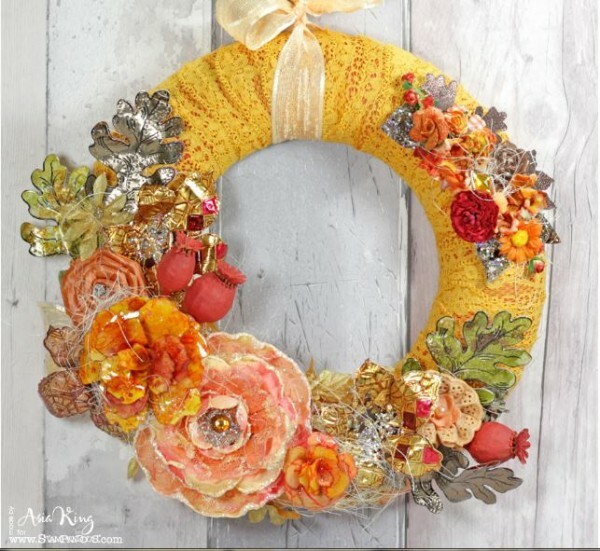 Hanging a wreath like this on your front door is sure get oohs and ahhs from your neighbors! Lisa King started with a Styrofoam wreath base, painted and wrapped it in ribbon and added her stunning embellishments like scrapbooking flowers from Prima, her hand made faux porcelain and enamel flowers (she includes how to links for making these) and leaves she made by stamping and coloring with alcohol inks and markers on thin sheets of metal. Find out more details on her blog Under a Creative Spell.